It is a rare author who can translate complex concepts into concrete and understandable portions for any reader to understand; yet this is exactly what Ian Mr. Stewart does in The Mathematics of Life. Basic principles of a startling range of scientific fields are explained with stimulating mathematical descriptions and interesting historical contexts. Although this may sound somewhat dry, The Mathematics of Life is written with perfect tone that will keep the reader engaged. With our growing understanding of the mechanisms involved in cellular and whole-organism biology, it has become increasingly possible to determine why these things happen, rather than simply recording them and trying to infer an explanation. For example, experiments that determine the function of a gene can easily be conducted using fruit flies, something that would have been impossible if the most basic principles of genetics were not understood. Sophisticated mathematical and statistical techniques are being developed to answer questions specific to biology, driving an exciting era marked by the synergy of these two fields. It is precisely these essential revolutions that author Stewart covers with astonishing breadth and precision. The importance of mathematics in many disciplines is covered, including the basics of genetics, DNA structure and replication, molecular biology, taxonomy, game theory, evolution, neurobiology, virology, population dynamics, and topology (or, knot theory), among many others. Readers newer to the nuts and bolts of biologic systems will appreciate Mr. Stewart’s easy explanations, and readers with a scientific background will be impressed by the level of scholarship contained in the book. Historical trivia and interesting facts also hold the reader’s interest. For example, Mr. Stewart discusses the pattern of spirals on pineapples and the heads of sunflowers in mathematical terms. Other interesting examples drawn from nature are covered. 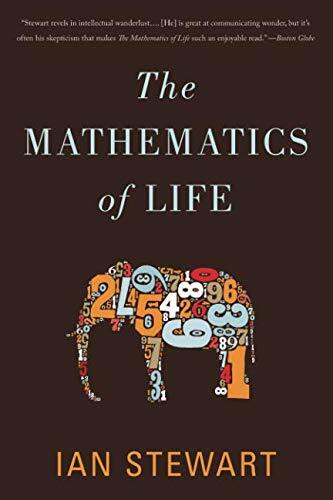 Overall, the reader will not be disappointed, no matter what he or she is looking for in this book: well researched and well written, The Mathematics of Life is an informative, compelling narrative of precisely the mathematics of life. It is likely that the reader will finish this survey of the sciences and end the book intellectually satisfied. Nicole Parker, Ph.D., is a medical writer who loves reading and writing about all things science.